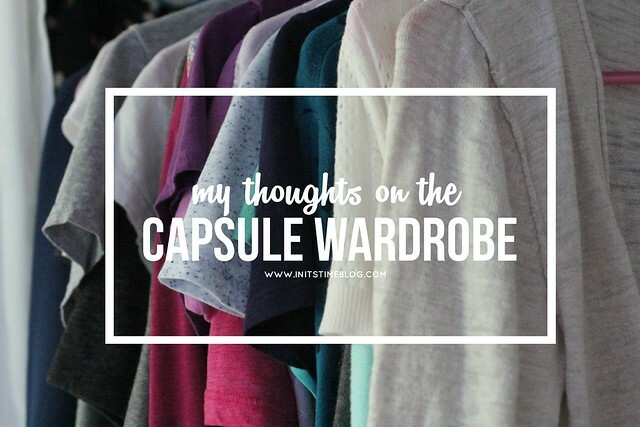 MY THOUGHTS ON THE CAPSULE WARDROBE. As a blog reader, I feel like it's my duty to follow along with trends. You know, keep up with what's cool and trendy. And something that I've noticed more and more throughout the fashion and lifestyle blogs is the desire to minimize and simplify your closet. To be honest, I was a little skeptical of this idea at first. Since college, I've been trying to really bulk up my closet after having lost weight (and thus many of my clothes). I've been trying to update my closet and really add some pretty and timeless pieces to my closet. So you could see why I was a little skeptical of the whole minimizing and simplifying part of the capsule wardrobe. I wasn't sure if it was a trend worth looking into or not. One that was worth my time, money, or effort. By the time I heard of the wardrobe capsule (read more on that here! ), I was just starting to feel content with my closet and wasn't really interested in jumping on the bandwagon on yet another blogger trend. But once I started thinking about it, I realized that I really agreed with and had already implemented some of basic concepts. For one, if I'm going to buy something, it needs to be timeless, comfortable, versatile (mix/match is a must! ), and washable (a preschool teacher must!). While shopping, I need to be able to envision my pieces worn in multiple outfits before I purchase them. I also have a monthly budget for clothes. Something, that since I've started my job--is a must for this girl over here. But the one thing I have a hard time switching over to is the quality vs. quantity piece. I've grown up in a culture that values finding good deals and as a teacher, I feel like it's turned me into an even more money-conscious person. I love reading reviews before purchasing items, shopping clearance sections, and getting the most bang for my buck. Which makes it a wee bit difficult to buy jeans for $100 or something like that (please tell me I'm not the only one out there?) --especially if the pieces are trendy and will likely be worn one season. Anyway, I've decided that like everything in life, you've got to make everything your own. And since I love the concept of a simplified closet, I've decided to make my own closet capsule of sorts. I've decided that before buying anything, it needs to first fit my closet wishlist (above). A list that I've written in my head and now have written down and slipped into my wallet as a reminder. If you have any recommendations for shops or pieces to add to my list, let me know! I'm still going to allow myself to shop the clearance section, but I'm also going to really think about why I'm buying an item. Is it because it's simply a good deal and will thus only be worn a few times? Or is it because it's a piece I can see myself wear multiple times (without it breaking/wearing out!)? What are your thoughts on capsule wardrobes? Or just buying clothes in general? Do you have a budget? Do you have any favorite stores/brands? And what about my beloved clearance section--do you shop there? p.s. Interested in seeing more of my closet? On August 20th, The Circle link-up is dedicated to sharing what's in our closets and there may or may not be a little vlog from yours truly, too. I'm hanging out in the clearance section with you! I can't see the point in spending full price on something especially on my teacher salary. Lately though I've been rethinking my wardrobe and purchases. If I don't love it/wear it then it needs to go. I've been trying to cutback on my clothes purchases unless it's something I love and will wear. I love your list of pieces to lookout for. I might have to create one when fall shopping begins to tempt me. Hey, the clearance section is where it's at! I love a good bargain but like you said, I also want to be more conscientious and just aware of what I have in my closet, too. i am borderline obsessed with un-fancy blog! i have seriously considered taking the same approach to my wardrobe. i am finally finding my own style, and i feel as though a capsule wardrobe would not only keep things fresh, but save money over time. i am starting a budget this month, so i know this will be beneficial! Now that I've finally figured out what I like (AND what fits my body type! ), I've also decided on not only saving money but also buying pieces I actually want in my closet. I love hearing about others' thoughts on minimizing wardrobes. For me, I think it's important to live a life of less, but it can be so hard applying this to our closets, especially with the culture we're living in. I am a huge clearance shopper too. But I always think before I buy, which is a huge thing! 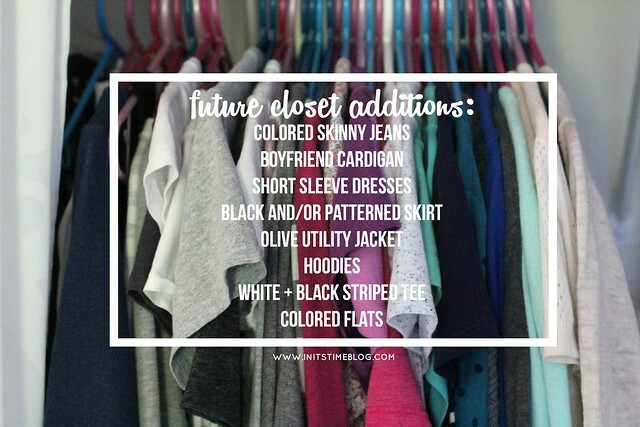 I love your future closet additions list. I think making a list like that helps us focus on what we want/need and helps us go at a slower pace with our purchasing. So awesome!! I completely agree with you! Living a life of less is something I'm constantly trying to do and it is definitely a hard thing to do when it comes to my closet. :) But like you said, really being conscientious about my purchases has been of great help and it's definitely helped me minimize my purchases. Clothes....I am a HOARDER. I have things in my closet from elementary school (tshirts) and jr high (real clothes - capris, shirts, etc.). If it still looks good and I like it, I pretty much keep it forever. Eventually there will be some serious downsizing! When it comes to buying clothes. I am to the point where I just buy in spurts during end of season sales. Occasionally I'll be out and spot something I like that is a good deal and grab it just because. My Mom taught me to always buy versatile pieces....Which basically means: I have a lot of teals, blacks, purples, browns, and navies. Oddly enough, I pretty much wear the same 20 or 30 items over and over again. That's why I know downsizing would be perfectly fine! It's funny because I have a few pieces from when I was younger, too! I don't wear them much, but I do use them (i.e. t-shirts) for yardwork or painting projects. The part that is the hardest for me in the capsule wardrobe trend is the idea of spending a LOT of money on one item. I have never spent tons of money on clothes and I am such a bargain girl that it's hard to dish out that much for something that I HOPE I will like. Plus, i love shopping- so where does that fit into the equation? Exactly! I have a REALLY hard time spending a lot of money one piece of clothing (especially if it's too trendy and will only be worn a few times). I've never been a girl who spends a lot of money on clothes (learned from my mom, I think!) and it makes it really hard for me to want to spend so much money, even if others think it's a good investment. I'm struggling with this as well. I want quality over quantity - but when I find a good deal on something I like....I mostly go for it. ive put myself on a clothing buying freeze for august, and it is really interesting to me how much I "miss" clothes shopping, but how I am able to use the clothes I have to make it through the week I do NOT "need" more clothes, just better quality to be honest. ive made a little list of things I've found online that I'm interested in buying once September rolls around but I'm not going to make myself do it. I love your "to buy" list. I think those are solid pieces that will really help build a good wardrobe. So many good thoughts (and all thoughts I agree with!). You and Amy H. are not alone when it comes to spending a lot of money on clothes, I'm the same way! I honestly cannot justify spending a ton of money on clothes because they get stained from work, go out of style, etc. And I totally get what you mean about clothes not fitting because of weight changes! I'm just now starting to build my closet again after having to donate and/or get rid of a lot of my clothes. Since making my clothes list, I've found myself buying fewer clothes, too. This whole wardrobe capsule thing has really made me re-think what I'm buying and why I'm buying it. I'll still always go with a good deal, but only if it really is something I'll wear and if it looks good on me, too. Even though I despise changing rooms, I've been trying to make myself try more clothes on. It's a love/hate relationship still, haha. I love your thoughts on this. Overall I've always been a capsule wardrobe person, without actually using that term. Shopping for cloths was always something special so I have always tried to pick out items that are timeless, will work with my current wardrobe, and are comfortable. I totally understand the concept of by quality items, but I think that is totally possible without spending an ton. 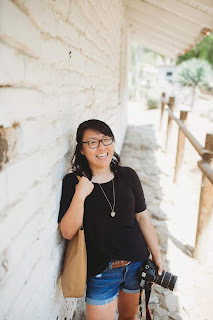 That is one reason I love ThredUp. You can find great quality items for a more reasonable price. I do love that you made a list for your wardrobe, I'm going to have to give that a try.